The 10 Best Burgers in Kansas! While the classic burger has been an American staple for over a century, the art of crafting up new and creative ways to make them has been a rising trend. And in Kansas, you can find some incredible options. Here are the 10 best burger joints throughout the state! Eating at The Burger Stand at the Casbah in Lawrence is an experience and a very tasty experience at that. The best burgers, the best service and the best atmosphere can be found at this burger stand. After you eat at Dempsey’s Burger Pub in Wichita you will walk away with a beefy burger experience. Good food, good service and a good atmosphere make this a good burger joint! A great iconic burger can be eaten at Cozy Inn in Salina. The history behind the burger attracts the customer, but the burger’s flavor keep customers coming back for more. A long-time favorite of locals, the Chuckburger in Topeka offers one of the best burger options in the state. Both the locals and newcomers can depend on a great burger made just the way they like it, always! If you are in or around Pleasanton stop by Cookees Drive-In and order the best hamburger around. This remarkable hamburger drive-in has been voted the best in Pleasanton for eight years running. Big Larry’s Burgers in Valley Center won’t disappoint hamburger lovers. Larry’s burgers are served up hot and delicious with the best ingredients. Stop by the BRGR Kitchen in Prairie Village and enjoy a new way to enjoy a classic hamburger. 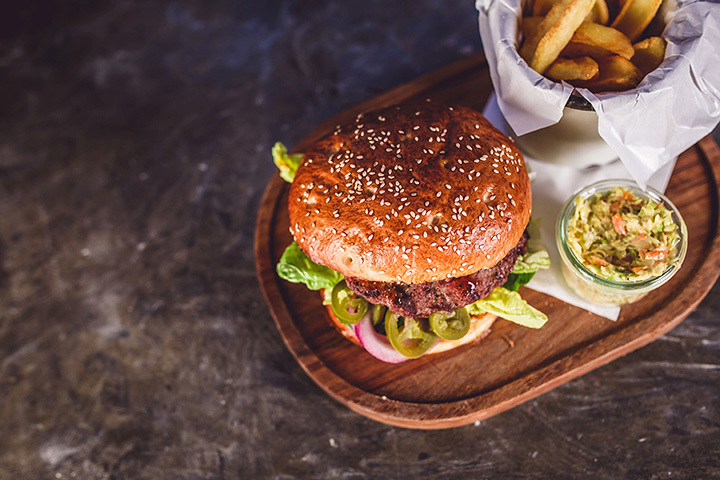 This restaurant prepares its popular burgers with the best ingredients in a classy atmosphere with the best service and all you have to do is enjoy a great burger. The Bomber Burger is a known burger joint in Wichita and over the past 60 years has evolved into a great place to enjoy a celebrated hamburger. Today the hamburgers are prepared with special ingredients and cooked when you ordered it. Always served hot! Enjoy a Bogey’s hamburger once, and you will be back for more. Bogey’s is located in Hutchinson and is a favorite of locals. Delicious food that is always served, in a superb atmosphere and with great service. At King’s Sandwich Shop in Iola, you will find one of the best hamburgers in Kansas. They fix great down-home hamburgers and the local fare is the best. Kings incredible service brings everyone back for more.